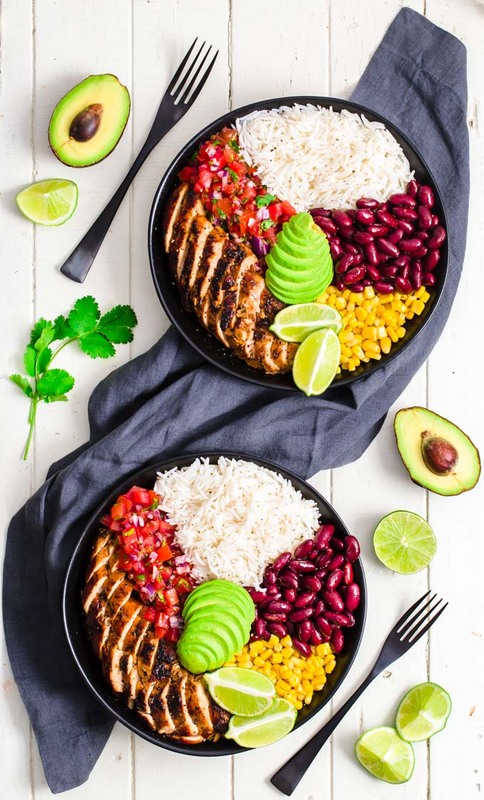 You know you want this healthy chicken Burrito Bowl Meal Prep in your life. Seriously guys, this recipe is so easy to make and so delicious, you’ll want to make it every Sunday afternoon! 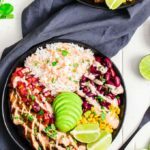 If you dig Mexican food, then you’ll love the clean burrito dressing (which is also a marinade) that comes with this recipe. 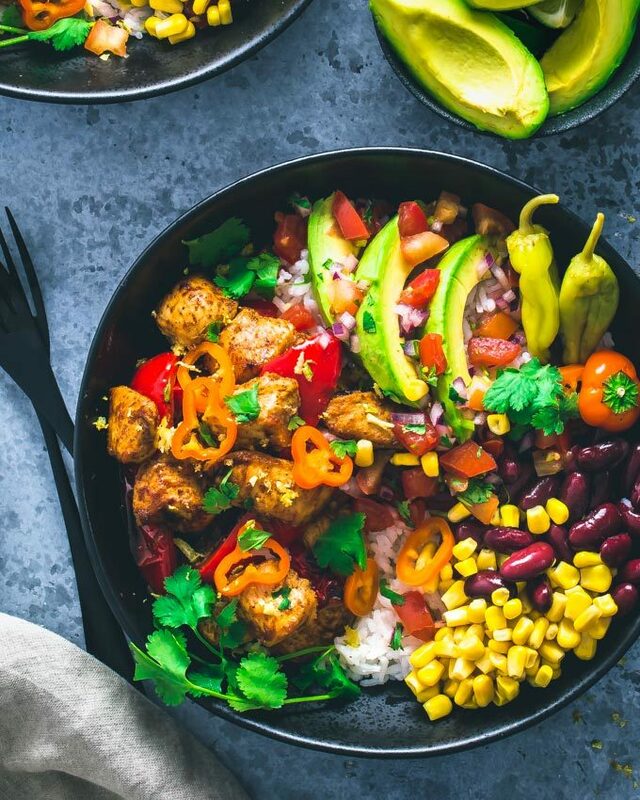 It gives so much flavor, you’ll want to eat it by the spoon! This recipe is also gluten-free, egg-free, and nut-free. Whoa, what a week! Skiing, skating, sliding with the kids. Staying up late, getting up early. We had a blast! But wow… I did NOT remember march break being so exhausting when I was young. I must be getting old, haha! But the memories and the smiles we put on our little ones’ faces are the only things that count in the end, right? Soooo… As I am writing this, we are Monday, early afternoon and I am so happy to be back! Creating those easy and delicious fitness recipes for you guys to enjoy has slowly become something that I really, really enjoy doing. Rice. Any kind. But my suggestion is either brown rice or basmati as both have a low glycemic index. Canned Corn. You could also use frozen corn. Canned Beans. I used red kidney beans in this recipe, but black beans are also a perfect fit. Salsa. Fresh is best (also called pico de gallo), either homemade or store-bought. No big deal if you can’t find fresh salsa, pick what you can find. Fresh Limes. You could also use lemons if you prefer. Chicken Breasts. Could be replaced with any type of ground meat. Taco Seasoning. Ain’t no burrito without the proper seasoning, right? Plain Greek Yogurt. 0% is best. Garlic Powder. Can be replaced by fresh garlic. 1. Cook the rice. Cook 1/2 cup rice according to package directions in a small saucepan. (Go on with the rest of the recipe while the rice is cooking. Don’t forget to set a timer!) Set aside when ready. 2. Make the marinade/sauce. Mix 0% plain Greek Yogurt with taco seasoning, lime juice, maple syrup, almond milk, and garlic powder. 3. Coat the chicken breasts. Coat the chicken breasts with half of the sauce from step #2. You could either marinate them for 2 hours (or overnight) or simply coat them and cook them straight away if you are in a rush, the choice is yours. 4. Cook the chicken breasts. Heat 2 tbsp olive oil and slowly cook them in a large non-stick pan for about 7-10 minutes on each side. Check the internal temperature with a meat thermometer and make sure to cook them until they reach at least 165F internal temp. 4. Prepare the rest of the ingredients. Prepare the rest of the ingredients while your chicken breasts are cooking. Just make sure to keep an eye on them (Again, use a timer!). That means, draining your cans properly and rinsing their contents in a colander, chopping the cilantro and preparing the avocado or guacamole if you are going to add some. 5. Slice the chicken breasts. Or cube them. 6. Assemble the bowls. 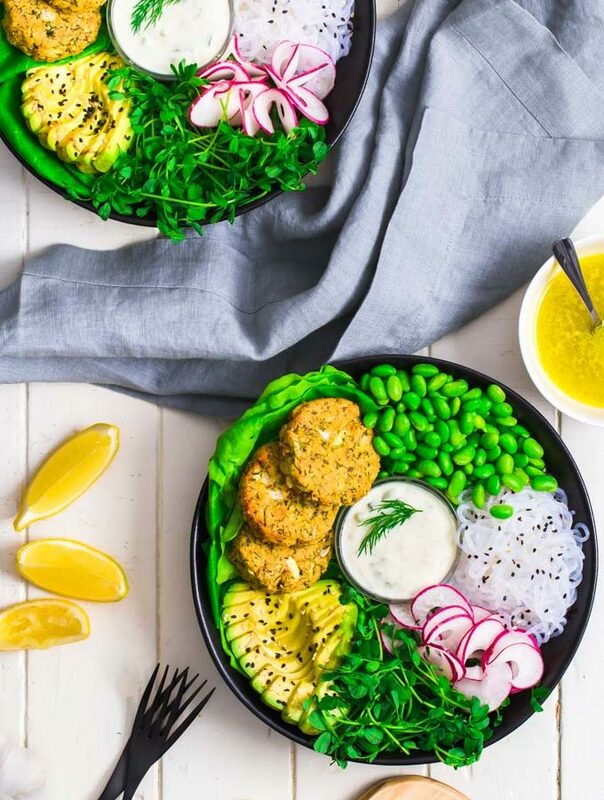 Simply put the ingredients in equal amounts next to each other in your bowls. 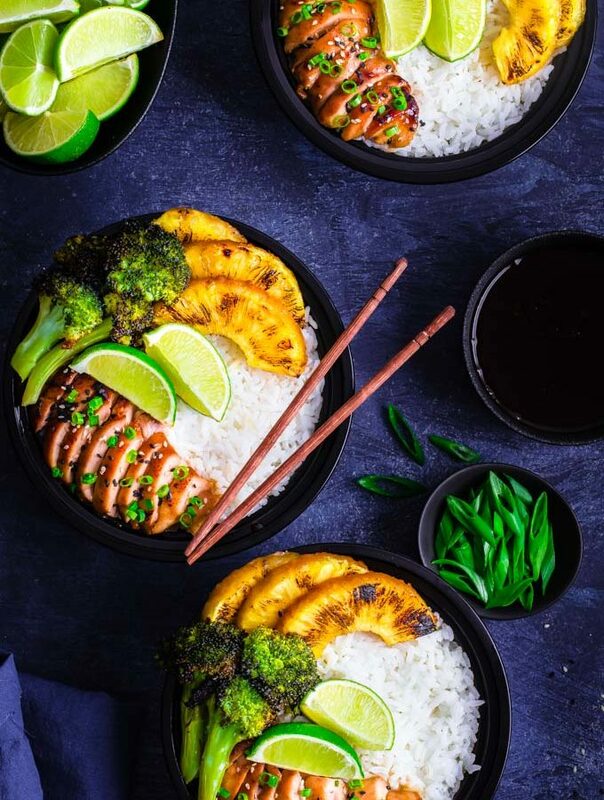 You could also put the rice in the bottom and place the rest of the ingredients on top. 7. Toppings. 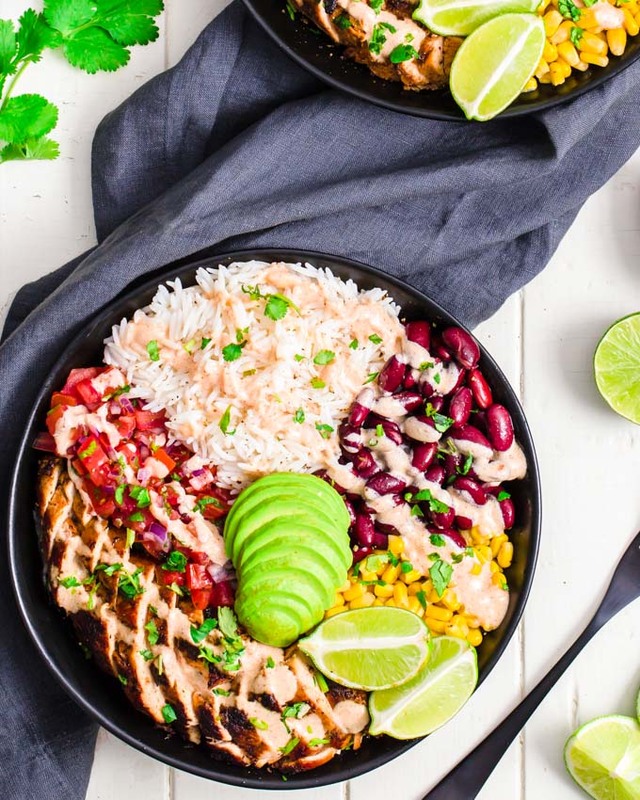 Place the toppings (sauce, cilantro and lime quarters) in small separate bowls until you are ready to eat. 8. Serve warm/hot. Could be eaten cold, but ideally, you want to eat this dish warm or cold. Place the toppings in separate containers. Wait until you are ready to eat to top your dish with the sauce, chopped cilantro, avocado/guacamole, and lime juice. If possible, serve warm. 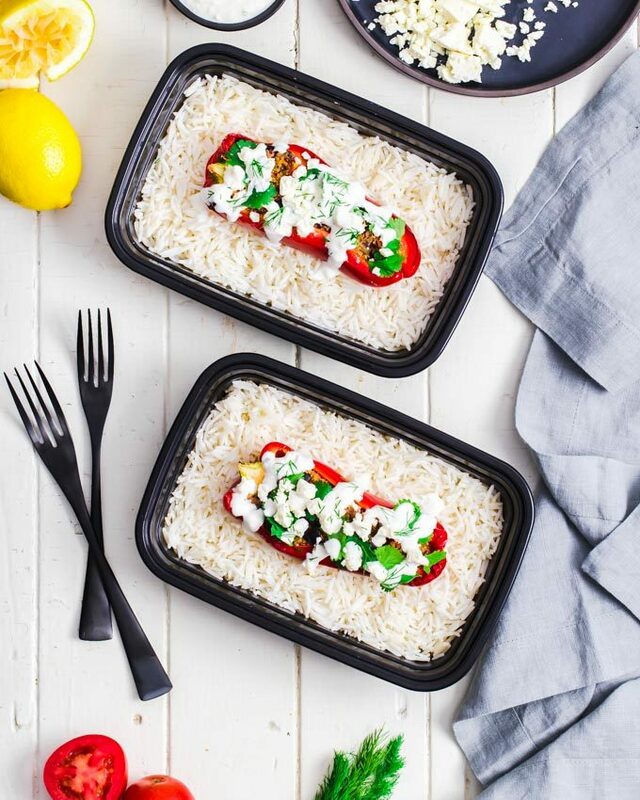 As stated above, you can totally eat this dish cold, but it will definitely taste better reheated. Salsa Fresca. The recipe calls for fresh salsa (salsa fresca), but if you can’t find any in store and you don’t feel like making your own, you can totally use any type of salsa. Diced baby tomatoes would also do the job. How to Store. Can be kept in the refrigerator for up to 7 days. To be eaten within 4 to 5 days for optimal freshness. 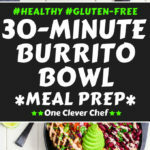 This Burrito Bowl Meal Prep is super easy to prepare. It will be ready under 30 minutes and will give you between 4 to 6 lunches, depending on your apetite. Cooking the rice: Cook rice according to package instructions in a medium saucepan. Set aside when ready. Making the Dressing/Marinade: Meanwhile, stir together 1 cup Greek yogurt, 3 tsp taco seasoning, 2 tbsp lime juice, 1 tbsp maple syrup, 3 tbsp almond milk, and 1 tsp garlic powder in a large mixing bowl until smooth. This will be used both as a coating/marinade for the chicken and as a dressing. Transfer about half of the sauce you've just prepared in 4 small airtight containers (So you can carry it separately and pour it over your dish when ready to eat). 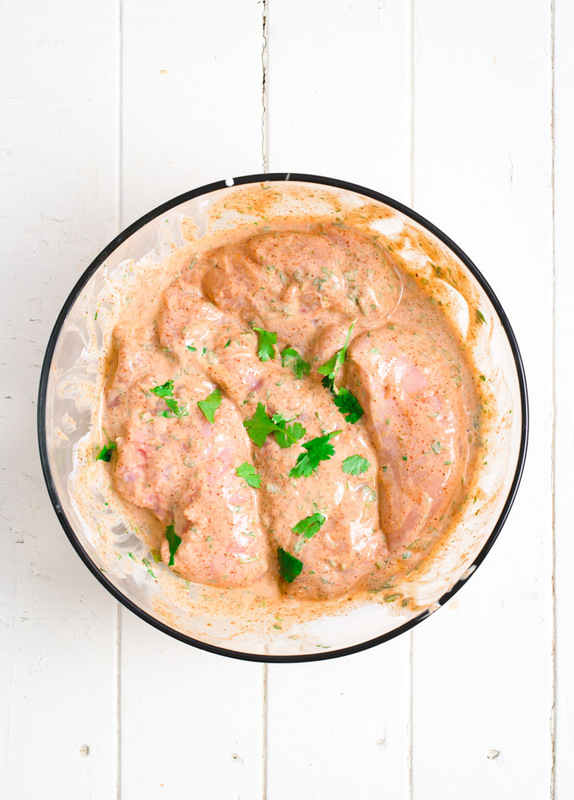 Coating/Marinating Chicken: Place the 4 chicken breasts in the large mixing bowl where the rest of the dressing is. Slowly stir to coat the chicken breasts evenly with the sauce. Note: This step could be done 2 hours ahead of time (or overnight), placing the bowl in the refrigerator for the chicken to marinate. 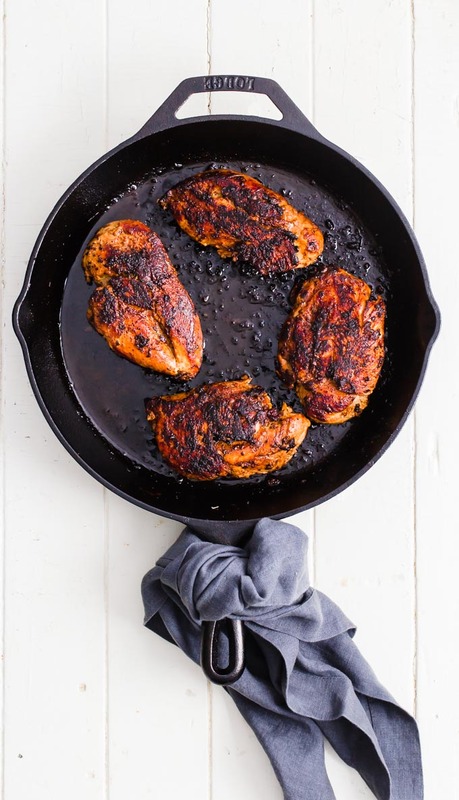 Cooking the Chicken Breasts: Heat 2 tbsp olive oil over medium heat in a large non-stick pan and cook the chicken breasts 7 to 10 minutes on each side. Important: Check the internal temperature of your chicken breasts with a meat thermometer. Remove them from heat when they reach at least 165F. Preparing the bowls: While the chicken breasts are cooking (don't forget to keep an eye on them! Setting up a timer is a good idea. ), open and drain the cans. Chop the cilantro and cut the limes into quarters. Place the cilantro in 4 small containers (you can mix it into the sauce or use separate containers). Place the rest of the ingredients evenly into the bowls as shown in the pictures above. Slice the Chicken Breasts: Then place them in your bowls to complete the dish. 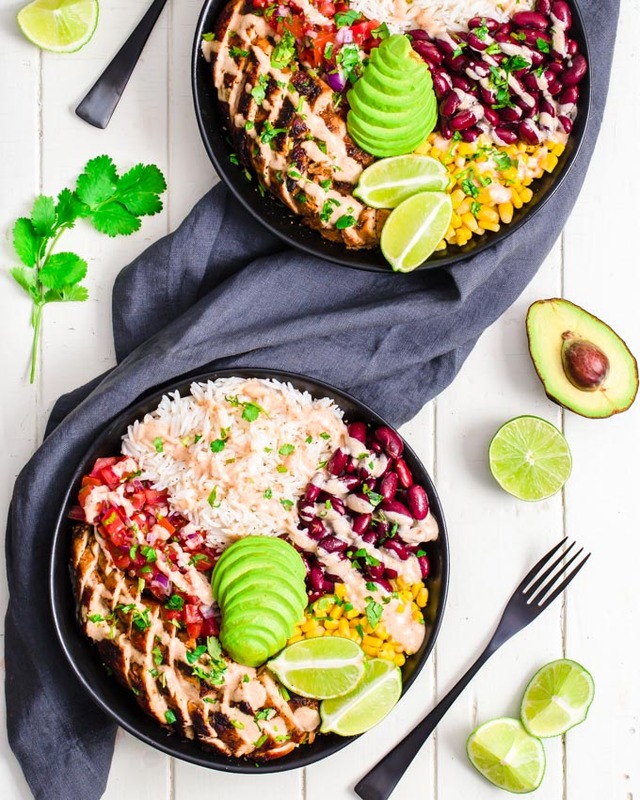 Serving Instructions: Reheat the contents of the bowls then top with some of the dressing, chopped cilantro, diced avocado, and lime juice. TIP: Avocado will turn brown/black over time. My suggestion is to either cube 1/2 avocado every morning or bring a knife with you and cube 1/2 avocado "on the spot". Also, depending on the type of greek yogurt used, you might have to add a little bit of water/milk to your dressing if you want it to be more liquid (1 tbsp at a time).